Travelling when you have a food allergy or intolerance, whether you are gluten free, wheat free or dairy free, is always a lottery situation. Ray and I always travel with two 100ml plastic bottles of soya milk (bottles obtainable from Muji http://www.muji.eu/ ), Eat Natural bars, rice cakes and Hob Nob biscuits (plain not milk chocolate) – just in case there are problems finding food we can eat. We lucked out on the flight to Virgin Atlantic http://www.virginatlantic.co.uk/ as we had pre-booked our meals. My gluten free option comprised vegetables in a tomato sauce, white and wild rice and roasted vegetables. There was even a gluten free bread from www.gfdiet.com, as well as salad and fresh fruit. It tasted scrumptious. The only down side was that there was no soya milk available on the plane for our tea. On arrival at a new destination, there is always the challenge of finding a supermarket or grocery store that sells soya milk. I had been told that it’s generally easy to eat out in New York if you’re gluten free or dairy free, but we didn’t find it so. Our first meal in New York was a total disaster. We were badly jet lagged and the waiter looked at us as if we were from another planet when we said that Ray was allergic to dairy. In the end we ordered mediocre salads………. At my cousin’s apartment, we enjoyed a Chinese take out so no problems there and Ray found soya milk (called soy milk in New York) at her local supermarket in the Upper East Side – small 50ml sizes which are easy to carry around. Alpro, please take note! Breakfast was definitely a problem. Our hotel the Flatotel http://www.flatotel.com/ only served cakes, croissants and bread – or fruit. I felt like something more substantial than just fruit, so called into the local Lindy’s on 7th Avenue. When we began explaining our problems to the waitress, she didn’t want to listen; she simply asked us what we wanted. I ended up with a dried up egg and some bacon. Is it the New York way to serve bacon so brittle and crispy so it has no flavour? Ray fared better with the bagel. What always amuses me in these situations is that after explaining that we are dairy free, they serve a jug of milk with the tea! It cost us U$18 (around £10) in all. Later in the day, at Starbucks http://www.starbucks.com/ we enjoyed a cup of tea with soya milk. I asked whether they sold the gluten free sandwich, which is available in the UK, but apparently there is so little demand, it wouldn’t be cost-effective, they said. For lunch, we met my cousin and her family at the New York Athletic Club, an impressive building with gold ceilings. She had kindly alerted them in advance about our allergies, so they were prepared. We both enjoyed Smoked Atlantic Salmon to start with, followed by Half Cornish Game Hen with spring vegetables and for Ray, Rack of Lamb. Delicious and a wonderful way of celebrating Easter Sunday – with a live violinist who went round the tables serenading everyone! That evening, my cousin cooked a mouth-watering lamb stew. I was at hand in the kitchen to read all the ingredients on the packets and jars of stock, spices and so on to check they were gluten and dairy free. As Ray is intolerant to many vegetables including courgettes, peppers and tomatoes, it was quite a challenge, although we got there in the end. She served us Tofutti milk free ice cream which was delicious and again, from the local supermarket. Thank you Janine. After our Lindy’s experience, we chose to have breakfast in our hotel. I opted for the fruit, while Ray checked with staff whether the bread and pastries had dairy in them. Lo and behold, they all did so Chef Ismail at the Flatotel rustled up some bacon and fried potatoes for us – the bacon, though crispy, tasted much better than the previous day. Thank you Chef Ismail – he also said to ask for him the next day and he would prepare something different. We took the Metro to 14th Street – Union Square – and discovered a farmers market http://www.unionsquarenyc.org/– not only that, there was a stand selling gluten free and dairy free cakes! Counter http://www.counternyc.com/ is an organic vegetarian bistro 105 First Avenue (6th and 7th St) with a gluten free and vegan menu. We didn’t have time to visit but their cakes were wonderful. If you’re looking for free from foods in New York, Wholefoods http://www.wholefoodsmarket.com/ is the place to go. This is the only store we found which had a separate ‘gluten free’ section which was extensive including raisin and pecan bagels, fudge brownies and non dairy chocolate cakes. In most stores, we found you had to hunt for any ‘free from’ items. What’s more, Wholefoods has published a “Guide to Gluten Free Shopping” to help shoppers identify items with hidden gluten. At the wonderful Strand Book Shop http://www.strandbooks.com/, which is similar to what was Borders in the UK, I chanced upon the “Babycakes Covers The Classics” recipe book, created by Erin McKenna, founder of Babycakes NYC, which sells dairy, gluten, egg, soy and refined sugar free cakes and desserts. The very same bakery that Glutenfree Mrs D http://www.glutenfreemrsd.com/ had told me about. After buying the book, we decided then and there that the bakery was worth a visit. Anyway I needed to get the book signed. Playing it safe for lunch, we opted for Pret A Manger at Union Square http://www.pret.com/ where Ray chose a tuna mayonnaise sandwich with lettuce, but crucially no butter, while I enjoyed a chicken, avocado salad with dried cranberries and tomatoes. All up this cost U$16.40. What we like about Pret is that they list all the ingredients so you can see at a glance whether you can eat a particular item. We got chatting to a New Yorker (as you do) who explained how to travel to Babycakes http://www.babycakesnyc.com/ on the Lower East Side by bus and this was a fabulous adventure taking us through parts of New York you don’t normally see. 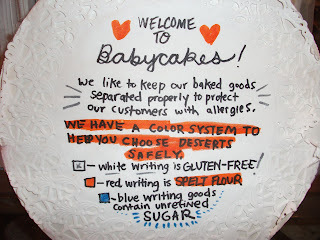 Visiting Babycakes was like heaven as when you step inside, you know you can eat everything on the menu! Not only are they dairy, gluten, egg and soy free, but also refined sugar free. Most desserts are sweetened with agave nectar, a low-glycemic syrup. So it’s very difficult to make a choice. 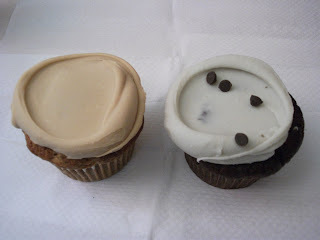 We opted for the chocolate mint cupcake and the banana cupcake, both of which were delicious. Normally I don’t like icing, but this icing, which they call frosting, tasted divine. Interestingly, they said that many people, who don’t have any food intolerances, eat their cakes because they love the taste. We also bought a gluten free doughnut and a slice of banana cake to go – needless to say they were delicious too. I asked for Erin as I wanted the book signed, but she wasn’t there – probably in LA where they have two branches. It has to be said this was one of the highlights of our trip. I will enjoy experimenting with the recipes in the cookbook. Meanwhile I had purchased The Vegan Guide to New York by Ryan Berry and Chris Abreu-Suzuki www.vegsource.com/berry and we chose to visit Lilli and Loos, Lexington Avenue, at 61 and 62 Streets, http://www.lilliandloo.com/, an Asian restaurant, which offers a special gluten free menu. 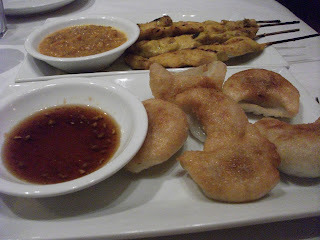 To start with, we had satay chicken (US$8.95) and oriental pork dumplings (US$8.50) (a treat as I normally can’t eat the dumplings). For the main course, I enjoyed Pad Thai noodles (US$12.95) while Ray had Singapore chicken noodles (US$12.95). Excellent service and delicious food. Chef Ismail wasn’t there, but the Flatotel served us sausages split down the middle, fried potatoes and peppers – is this breakfast? Still you’ve got to feel grateful that they have offered us an alternative. I just ate the potatoes. We then accessed the Internet at the hotel’s business centre downstairs, but can’t book our airline seats as yet. This is the best kept secret in the hotel – free Internet access and you can even print off material! We ask where the nearest supermarket is and are told it’s Ernst and Stein, 7th Avenue between 55 and 56 streets. By this time, the temperature had soared and although it’s only April, the heat is unbearable and it’s only 10.30am. The forecast says 27 degrees and yet we were told 18 degrees with rain! We buy water and bananas; they is no ambient soya milk. As it is so hot, we decide taxi is the only way to travel and go to the Metropolitan Museum of Art and view a guitar exhibition with iPod multimedia accompaniment accessing us to commentary and music played by various guitarists. Paul Simon’s guitar was even on display! For lunch, we go to the cafeteria, a real “free for all” reminiscent of a school meals approach. You have to get your tray, cutlery and napkins before you select the food. We opted for the safe choice – the salad bar although labelling was minimal so it was a case of recognising what the food was, but at least there were items we could eat. We couldn’t see any signs or anything geared up for people with food allergies. They weigh the salad and then tell you the cost. Our bill was US$23.83, plus US$3 for chips. As we left the museum, the hot sun pulsated down as if it was a desert so we hailed a cab and took refuge in Barnes & Noble which has moved to 82nd and Broadway. It is air conditioned! 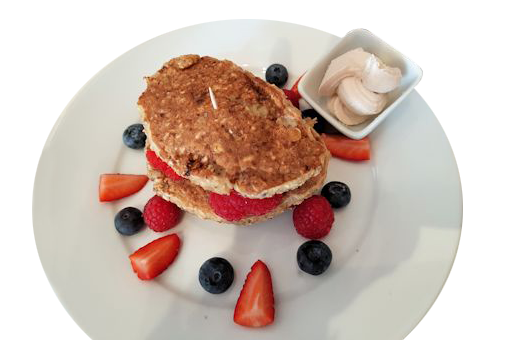 At Le Pain de Quotidien at Broadway and 91st Street, we met Penny Hammond, who runs the http://www.chewinfo.com/ site all about food issues. I’d always dismissed the UK branches of this eatery thinking they only served breads and pastries, but was delightfully surprised when I was told they served gluten free and dairy free coconut macaroons and almond meringue, so we ordered one of each – the meringue was enormous so we took half away in a goodie bag. The menu has symbols indicating vegan choices. For example, Quinoa and Orugula with chick peas, artichoke and basil pesto. Soy milk was available for our tea. Our friend Robin had gone to great trouble that evening to serve a meal we could eat – it was delicious - baked cod with mushrooms and artichokes. We discovered how to cook and eat artichokes. Thank you Robin. Chef Ismail at the Flatotel excelled himself today and gave us ham, fried potatoes, courgettes (or zucchinis as they called in America) and green beans in olive oil – delicious – thank you again, Chef. We headed back to Soho and Greenwich Village, our favourite neighbourhoods for more browsing and shopping. Down Bleecker Street, there were plenty of bakeries but none serving gluten or dairy free items. In fact when I asked Amy’s Bakery whether they served gluten or dairy free, the shop assistant looked aghast as if I’d spoken a foreign language. We passed the famous Magnolia Bakery, but it was so crowded, moved on quickly. We chanced upon Hummus Place, which is listed in The Vegan Guide to New York, on 7th Avenue south between Barrow and Bleecker Streets http://www.hummusplace.com/ This restaurant, as you’ve probably guessed, is devoted to hummus, which is one of our favourite foods – as it’s both gluten and dairy free.You can order two difference styles of hummus – one made from fava beans and chickpeas and one from whole chickpeas. We opted for the Lunch Special at US$7.95 which included a dish of hummus and one appetizer. So for appetizers, we ordered falafel and tahini and for the mains, hummus masabacha with whole chickpeas, olive oil and spices and Ray had hummus with mushrooms. I explained I was gluten free, so instead of pitta bread (which doesn’t have milk in it so Ray was ok), I was given crudités of carrot and cucumber. The hummus is served on a medium-sized plate with the mushrooms or chick peas inside a circle of hummus. We found it filling so were unable to sample the vegan desserts such as vegan almond raspberry chocolate brownies. If you’re homesick for Old Blighty, there’s Myers of Keswick on the corner of Horatio Street and Hudson Street selling British items like PG tips, Hob Nob biscuits and Crunchy Nut cornflakes. They’d sold out of Wills and Kate Royal Wedding postcards! That evening, my cousin had booked a table at Candle 79 154 East 79th Street at Lexington Avenue http://www.candle79.com/. A well known vegan eatery, again listed in The Vegan Guide to New York. 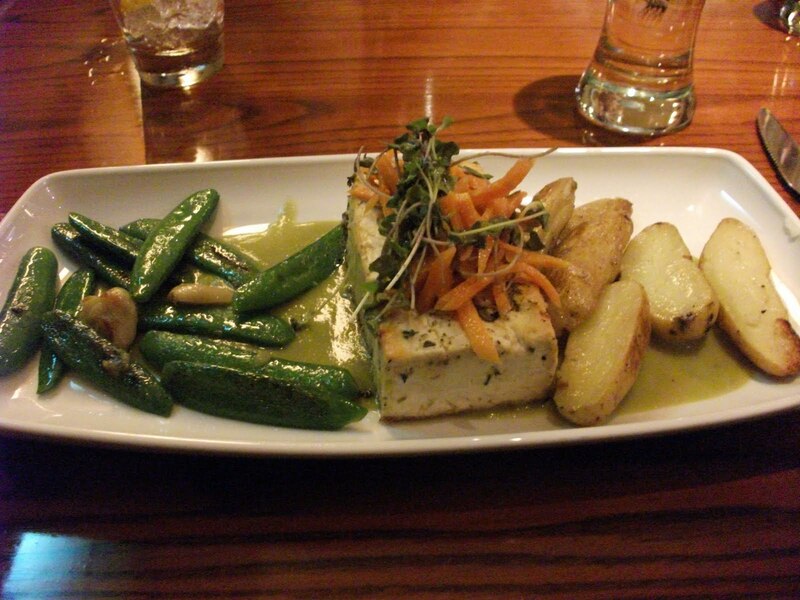 The guide says that Seitan Piccata (US$23) with steamed spinach, savory potato cake and lemon caper sauce is Sir Paul McCartney’s favourite dish. So what is seitan? It’s gluten which has been boiled in a gingertamari broth. Being gluten free, I gave this one a miss, but my cousin and husband ordered it and said it tasted great. It has to be said our waiter, John, was extremely helpful and patient, taking time to explain the various dishes. They have a special gluten free menu. For starters, I chose vegetable quinoa nori rolls – pickled ginger, avocado wasabi, chipotle aioli and tamari ginger sauce (US$14) which was similar in presentation to sushi, although tasted more spicy. Ray ordered smoked hummus (US$13) – he can’t eat enough! For mains, we both enjoyed Herb Baked Tofu with roasted fingerling potatoes, garlic sugar snap peas, mint fava bean sauce and pickled carrot salad (US$22). Normally I find tofu bland tasting like blotting paper, but this was flavoursome and tasty. Dessert was a treat – dairy free ice cream for Ray and I chose the Key Lime Parfait (US$13) a nut granula lime cashew cream cococnut ice cream. Bliss – it’s so rare that we can have dessert in a restaurant! And so our trip came to an end. We were so pleased to have discovered so many ‘free from’ establishments in New York, but they aren’t easy to find. Wake up New York supermarkets – we need you to introduce ‘free from’ sections as in UK supermarkets. 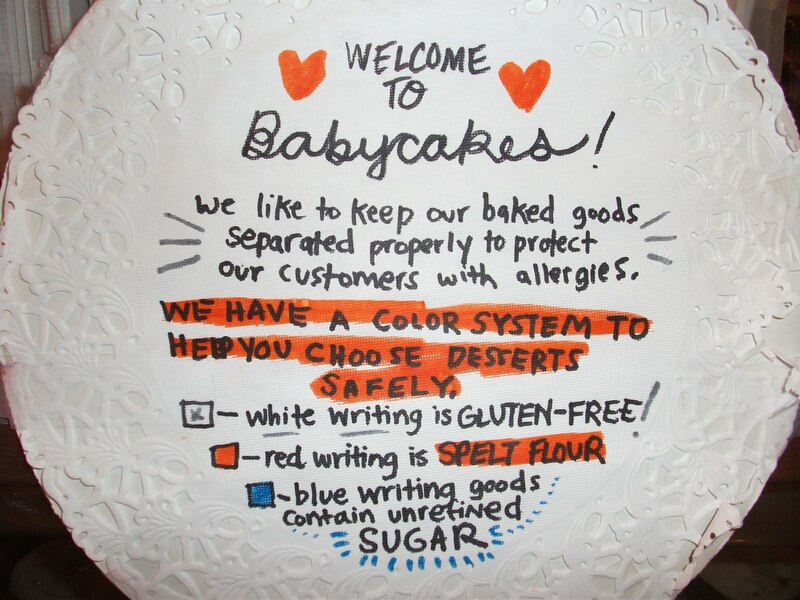 Babycakes http://www.babycakesnyc.com/ – nirvana - dairy, gluten, egg and soy free, but also refined sugar free cakes, cupcakes, desserts, doughnuts. Get the recipe book.